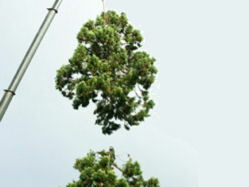 Crown reduction and shaping is specifically for large and older trees. This is a very important aspect of arboriculture and the care of trees. As all our operatives are highly trained to look after this type of work. The most important part of crown reduction is to consider the aesthetic elements of the tree and to thin the tree, removing all deadwood. Shaping the crown gives a pleasing look to the tree and altogether makes a healthier tree, allowing wind easily flow through and around the branches. Felling trees in a controlled and safe manner is more than just knowing how to cut down trees. The felling and removal of dangerous trees is a specialist service with the skills of highly trained technicians and surgeons. There is often the requirement of particular equipment, cranes to remove large trees across buildings or other items that could block larger machines being brought on to the site where the trees are. It may require hoist removal, rigging or straight felling. Some utility and government agencies have special requirements. 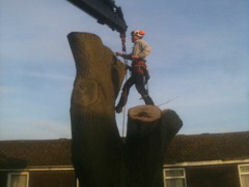 Local Tree Works have not only the skills but also all the equipment that may be required for any type of felling work. This means that there are no delays on any of the work that we carry out. At Local Tree Works our consultant arborists are fully qualified and continue training to maintain their skills to a very high degree knowing when to crown clean, crown thin, raise or reduce. It is important thatalmost all urban pruning that is done is a corrective structural pruning that is for the long term benefit of the tree and its environment. Urban pruning, its merits and requirements, is one of the most vexing debates in the world of tree care. Too many 'so called' tree care companies simply hack and chop away at trees in the urban environment due to pressure from clients and from a lack of knowledge. In actual fact it can be more dangerous to cut away good wood from a vigorous tree than to leave well enough alone. New shoots can grow and be structurally unsound where a tree has been pruned for the sake of it. When trees are cut down to ground level or above, they leave a 'tree- stump' where nothing can grow except mushrooms and shoots from the still-living root system. A variety of special tree stump grinding equipment is available depending on the size of the tree and how deep the stump is. Tree stumps are unsightly and can be difficult to remove. 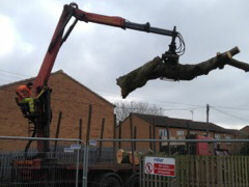 We can remove the smallest to the largest of tree stumps, even in the most difficult locations. Clearance of tree stumps using our fleet of stump grinders of different capacities is fast and efficient. We have the capacity to remove one single stump in the back garden of a property, or stumps in roadside situations, or clear a whole site for building and civil engineering projects. Most felling operations face a need to get rid of branches and tree tops left after the timber is harvested from a site. We have a variety of chippers that grade the size of the chips so that they can be used as mulch. Woodchips make excellent mulch for trees and shrubs. A three-inch layer of woodchips will prevent the growth of weeds or grass around the base of the tree. Mulching also conserves moisture, prevents erosion, moderate soil temperatures, and adds organic matter and nutrients to the soil. Woodchips are slow to break down, so they do not have to be replaced as often as some other mulch materials.